The ball and shirt of the Vietnam national under 23 team which presented to Prime Minister Nguyen Xuan Phuc will be auctioned for charity. Minister of Labor - Invalids and Social Affairs Dao Ngoc Dung (left) and Minister of Information and Communications Truong Minh Tuan receive ball & football shirt of Vietnam U23 team offered to Prime Minister for auction. Prime Minister Nguyen Xuan Phuc asked the Ministry of Labor - Invalids and Social Affairs and the Ministry of Information and Communications to co-jointly organize the auction of the ball and shirt. All the receiving money from the auction program will be dedicated to the families of meritorious services to the country’s revolution and poor households. 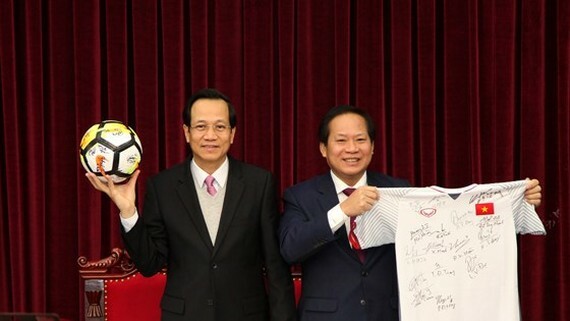 At the recent meeting with leaders of the Government, Vietnamese Prime Minister Nguyen Xuan Phuc has received the ball and football shirt having signatures of the U23 Vietnam members. The auction program is expected to be held before the 2018 Lunar New Year. In particular, these two items will have the autograph of Prime Minister Nguyen Xuan Phuc. After returning from the 2018 AFC U23 Championship with the title of runner-up, the football team was received attentions and encouragements from millions of Vietnamese red- clad fans.